Basements in the Tidewater Region of Virginia are one of the most common hot-spots for mold development. Basements are often damp and tend to suffer from insufficient air circulation. Water seepage through the foundation walls is a common obstacle as well. Once moisture is introduced to the environment, mold can begin to develop. Once mold takes hold in your basement, it can spread quickly due to conducive conditions. Don’t just live with a moldy basement. 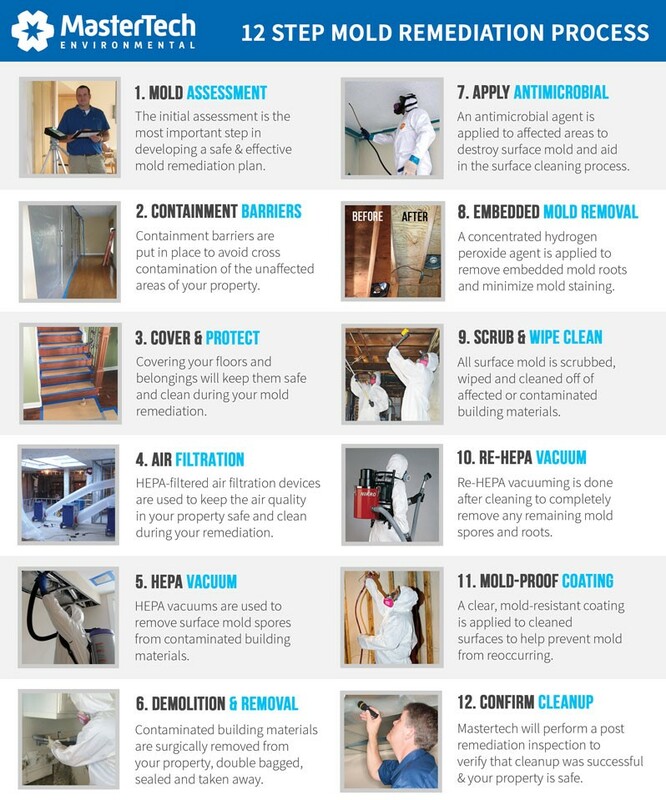 Our licensed & certified mold experts can help. Mastertech of Tidewater’s team of basement mold inspectors and basement mold removal technicians can determine if your basement has a mold problem, identify what caused the mold problem and develop a safe and effective basement mold removal solution. Once we are able to confirm a successful basement cleanup, we will provide moisture control recommendations to ensure that the mold does not return. Why do I have mold in my Virginia basement? If you suspect damp conditions in your residential or commercial basement have contributed to mold development, you should contact a professional mold inspector Virginia to conduct a thorough basement mold inspection. Visual Assessment– Our inspector will conduct a full visual inspection to identify any conditions that could be promoting and sustaining mold growth in your basement. We will provide you thorough digital documentation for your records. Moisture Mapping– It is important to get to the root of the problem, so your inspector will carefully map out the damp or wet areas of your basement to determine where moisture starts and stops, and how it could be contributing to mold. Moisture Meters: Moisture meters allow your inspector to read the moisture content of basement building materials. Moisture locked within porous building materials like foundation walls can easily go unnoticed for an extended period of time. Thermal Imaging: Your mold inspector will use the temperature difference between wet and dry materials to determine what areas have been effected by the moisture. Your inspector will be able to clearly identify all wet areas and understand the full extent of the moisture and mold problem. Basement Mold Testing– Surface and/or air quality tests will provide scientific data that will confirm or deny the presence of mold. If mold is confirmed in your basement, the test results will help your inspector figure out the most appropriate course of action to resolve the mold issue. Report of Findings– After completing a thorough mold inspection of your basement, your Mastertech mold inspector will compile a clear and concise report that outlines all his/her findings. If necessary, your inspector will present you with a detailed scope of work for a safe and effective basement mold removal in Virginia. At Mastertech Environmental our team has worked hard to develop a mold removal process that guarantees the best results. Our team is fully trained, certified and insured to provide mold removal services throughout the Tidewater Region of Virginia. Each mold technician is carefully trained according to our intensive training guidelines, and we maintain strict adherence to all safety protocols. Our top priorities are, and will always be, client safety and quality control. At Mastertech, we will never compromise our standards or client safety for any reason. The certified basement mold removal professionals at Mastertech Environmental of Tidewater will carefully develop the safest and most effective basement mold removal solution to ensure a successful clean up. Our mold inspectors and mold technicians stick to a basement mold removal process that ensures the safest, most effective and most efficient cleanup possible the first time. Each mold removal project, completed by Mastertech Environmental, is backed by a 5-year, mold-free warranty. It is our promise that the mold has been safely and effectively removed, and it will not grow back. Call 1-757-932-2772 today to learn more about our basement mold removal services. We will be happy to answer all your questions and schedule you for an appointment with one of our trained and certified mold inspectors. Do you detect signs of moisture buildup or mold development in other areas of your home? We can help with attic mold removal in Virginia and crawl space mold removal in Virginia as well. I found MasterTech on Google. Tom responded very quickly and was very professional at all times. I could not have asked for a better group of guys that worked well with the customer and with each other. They did a good job cleaning my mom’s house and I am very appreciative. I would gladly recommend them to anyone. Thank you. I own an old colonial style home that had a serious mold problem in the basement. Tom was out the same day I called and had his crew there the next day. The service was exceptional, done on time and at a great price. A little over a year has passed and there is no sign of mold returning, everything looks as good as the day it was finished. Two thumbs way up. Read more of our awesome reviews! Do I Have Mold In My Virginia Home?